A number of you have asked for it, and I honestly didn’t know when we were going to run our next sale. It seems appropriate now that the dreaded tax day is upon us that we should have a tax relief sale. Prices are already marked on all three sites. Sale ends Friday 13th at midnight CST. Tweet, Facebook, Blog, Google+, or anywhere you have social media (forums of any kind) about the limited time sale. Email me Dkchase12 @ gmail.com with the subject line JCS. In the body of the email mention all the places you spread the word. For each unique place you get one entry. Friday (4/6) morning I will pull two winners, both will receive a $25 Gift Certificate to either Amazon or Barnes and Noble. 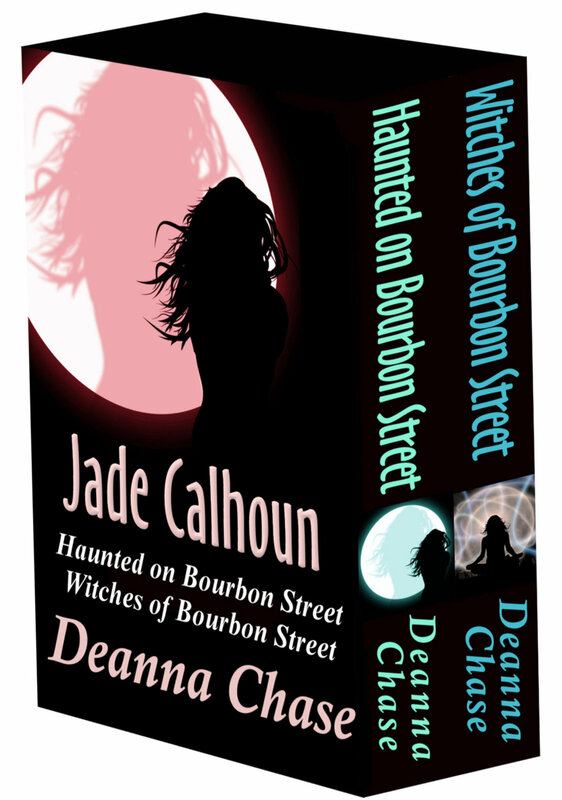 Great deal on the two book boxed set, Paranormal Romance~Jade Calhoun Series by Deanna Chase. Only $1.99 on Amazon http://tiny.cc/pr46bw and B&N http://tiny.cc/ip46bw for a limited time. Thank you all! I really appreciate the help spreading the word. Happy Thanksgiving to those in the US. Happy holidays to everyone else. Greg and I are spending a quiet Thanksgiving together with our giant twenty pound turkey. Yep, twenty pounds for two people. We love leftovers. While I’m slaving over a fancy Thanksgiving dinner for two, we are running a sale! This is our annual Giving Thanks sale. Sale starts at midnight Thursday morning and runs for 48 hours, ending Friday night at midnight (11/26/11 @ 12:00am). Thank you so much for all your wonderful support. We couldn’t do this without you. Heads Up! After Labor Day Sale is Here. Greg and I hope you all had a fabulous Labor Day. We got hit with Tropical Storm Lee, so we saw a lot of rain. Other than a few downed limbs, everything is fine and the sun is shining today. A perfect day to celebrate our 25% off everything After Labor Day Sale. Everything is 25% in the murrine Etsy shop. Everything is 25% off in the bead Etsy shop. Prices are already marked in both stores. And the website has both beads and murrine. Discount will be taken at checkout. Sale ends Friday night 09/09 at 11pm CST. And if that wansn’t enough. My good friend Lisa Liddy of Metal Me This is having a sale as well. Her After Labor Day Sale. Stop by her Etsy store today through Thursday (until midnight eastern time). Spend $50 or more and receive a FREE set of bead caps (2 pair of BHB caps or 4 pair of regular beadcaps). Just put in the Notes section if you prefer Copper or Brass and if it’s BHB, let her know if you want to fit sterling tubing or copper tubing. Pattern and cap size is her choice, but you know there are no bad choices there! FREE SHIPPING on orders over $50 also. Use the Etsy FREESHIP coupon at checkout. Happy Week before Thanksgiving Week! Greg and I have been busy doing shows and we are done for the year, so it seems like a good time to run a sale. I am running at 20% off all items on etsy, artfire, and the website. Just write in my message to seller section “Thanksgiving Sale” and I’ll either send a revised invoice or refund the difference from your paypal payment. Last day of the sale is Sunday the 22nd. Happy shopping! Newest 9.99 offerings on ebay. Today is the last day of my 9.99 ebay auctions. I have run them for a full week and there are great deals to be had. Don’t miss out. Here are the lastest ones.